I just love when SU comes out with a new catalog - it gives me a whole lot of inspiration for my card layouts - not only sketches, but also color combinations! 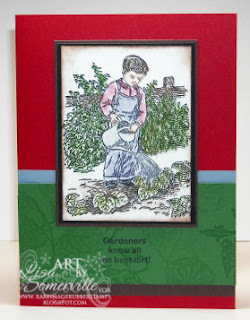 The two cards that I'm posting here both use sketches found in the Spring Summer Catalog - I just changed the colors to work with the new Garden Sheet images I'm using from Rare Image Rubber Stamps. On this first card I stamped the Tree image from the Garden Sheet in Artichoke, then added some Flower Soft to the tree to create my leaves. If you haven't seen Flower Soft yet - you should check it out - it's a cool texture to add some dimension and color to your stamped projects. This second card also uses images from RIRS Garden Sheet - here I used the Pastel Detailing Technique from a past TJNL to add color to my focal image. The vine and sentiment are also part of this sheet. Right now Nancy at RIRS is running a special - purchase the new Garden Sheet and only pay $1.00 for Domestic Shipping! 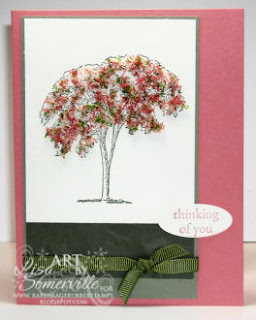 I totally love love the tree card. I have some Flower Soft but haven't used it much. I need to dig it out. These are both so very lovely Lisa!